The end of the school year is drawing closer which means summer is rapidly approaching! Now that your children (hopefully!) have less homework, you can spend more evenings relaxing together. Perhaps you even have more time to cook together! Today, we have a delicious dessert recipe that kids will enjoy helping to prepare. This yummy treat is so simple to prepare and it makes a great dish to take to a cookout or potluck. Cheesecake Strawberry Salad is a sweet treat that both you and your children will love snacking on! This recipe has two different kinds of fruit in it, so that makes it a “healthy” dessert option doesn’t it??? 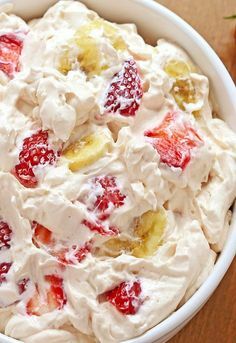 In a large bowl, mix together the pudding mix, Cool Whip (or other whipped topping), and strawberry yogurt. Use a whisk to thoroughly blend the ingredients together. Refrigerate the mixture for at least an hour. In the meantime, you can pre-slice your strawberries. Hold off on slicing your bananas until you are ready to serve the dessert. After the mixture spends an hour chilling in your fridge, pull it out and add in the sliced strawberries. Then, slice your bananas into thin slices and add those as well. 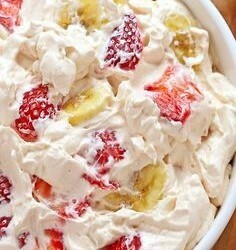 Gently fold the bananas and strawberries into the mixture. Then, add in your mini marshmallows if you have chosen to include them. Your delicious Cheesecake Strawberry Salad is now ready to serve! Remember, the bananas will get brown so try to consume this dessert within one sitting.